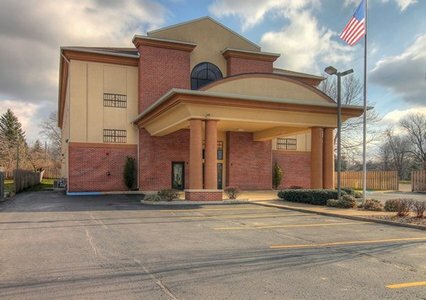 Stay a short drive from the beaches of Lake Michigan and Silver Beach at the Quality Inn & Suites® hotel in Niles, MI. Dine at one of several restaurants adjacent to the property, including Hob Nob, El Amigo Pepe, Mancino’s Italian Eatery and Prime Table. The area also features several breweries and wineries. Your guest room features a cable television, coffee maker, hairdryer, iron and ironing board. Select rooms contain microwaves, refrigerators, desks, whirlpools and kitchen facilities. Stay productive with our business center containing computer, copy and fax services. Pets are welcome for a nominal fee. Ample parking accommodates trucks and buses. Whether traveling to Niles, MI for business or pleasure, the Quality Inn & Suites provides inviting accommodations and exceptional service for all guests. We look forward to your stay.